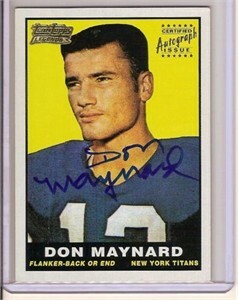 2001 Topps certified autograph card of Hall of Fame receiver Don Maynard, the favorite target of Joe Namath. Authenticated with Topps numbered hologram sticker on the back. With certificate of authenticity from AutographsForSale.com. ONLY ONE AVAILABLE FOR SALE.